More info on this and other events. 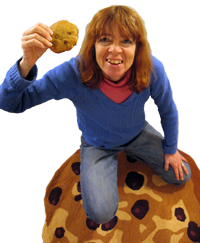 I will launch the book in the town where this cookie began. The Saturday, Oct. 19 event will be held at the Whitman Public Library, 100 Webster St., Whitman, Mass. from 2:00pm to 3:30 p.m. Saturday, Oct. 19. 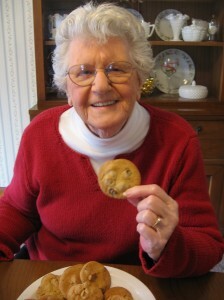 It will and feature a Toll House cookie contest and a panel discussion featuring former Toll House employees, including Marguerite Gaquin (pictured below), daughter of the late Toll House baker Sue Brides. This will be followed by a book signing. 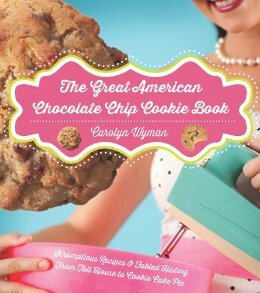 Cookie entries need to be at the library by 1:15 p.m.; the panel discussion begins at 2 p.m., followed by the cookie awards ceremony, book signing and refreshments (featuring guess what!). The event is free and open to the public.